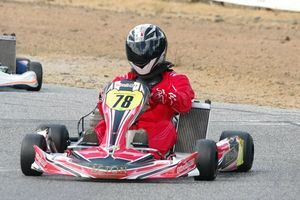 The 8th annual Arise Racing King of the Hill was run in great weather conditions with a format that was new to WA Karters. The Seniors ran on Saturday & the Cadets & Juniors raced on Sunday. The feedback from competitors was extremely positive after the event. The event always features the TAG 125 Restricted classes, highlighted by a particularly large field of 30 Mediums, the big fellas were out in force. 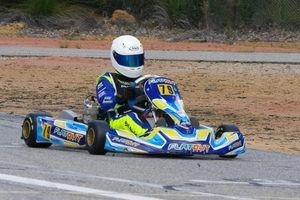 Their King of the Hill for 2017 was Adam Cornick who dominated the meeting in his Energy Kart, P plater Neil Power was second with Troy Stewart in 3rd. The TAG 125 Restricted Light King of the Hill was Tom Bowsher made it two in a row with 4 wins, Roy Tester was second and P plater Mitchell Hade drove consistently for a fine 3rd. Kip Foster absolutely dominated the TAG 125 Light class this day making sure he stayed ahead of the carnage behind him, he won every race, he even won the final by 7 seconds over TAG rookie Shae Thompson. 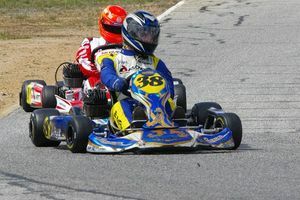 Young Cory Minton was second overall with the evergreen Adam Levi driving with a level head to take 3rd on points. 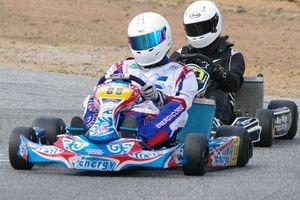 State Champ Simon (Gumby) Gwilliam showed the heavies how it’s done in his Formula K with pole and winning every race. 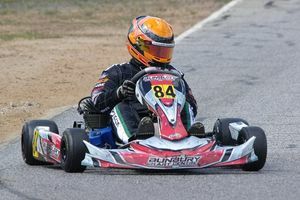 Bayley Bell bought his buggy home in 2nd overall with the persistent Lewis Shugar grabbing the bronze in his CRG. KA3 Light was lead all the way by State Champion Tom Schou until 6 laps from the end of the final when his accelerator jammed, sending him into the dirt for a DNF. This enabled the Gillard pilot Daryl Henderson to take the overall win, Schou managed 2nd on points with Bradley Nock scraping in for third. 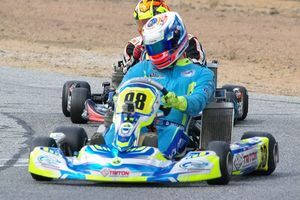 KA3 Medium was mainly a race between Jason Betts & Jayden Peirce, with Betts taking a clean sweep while Peirce was snapping at his heels. 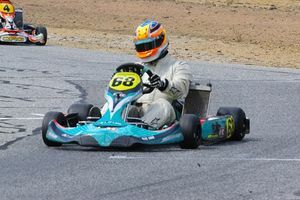 Shae Thompson bought his Arrow home in third place overall after overcoming a few technical issues early in the meeting. 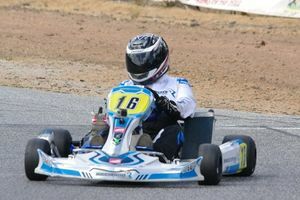 Jason LeCocq lead a strong field of 15 Opens all the way in his twin Rotax to take the gold from Blake Preston who finally had a meeting without a DNF and Nathan Will driving consistently for the bronze. This professionally run series will produce their own report, however Jake Klarich took home the spoils in the final from Simon Gwilliam and Daniel Currey. The guys put on a great display of racing. A good field of 17 Cadet 9’s took the green lights and was won by Nash Ferraro with 3 wins & a third over State Champ Jackson Mitchell-Rosenauer and a rapidly improving rookie by the name of Zane Rhodes took a great third place overall in his Arrow. A massive field of 26 Cadet 12’s made for some awesome racing. 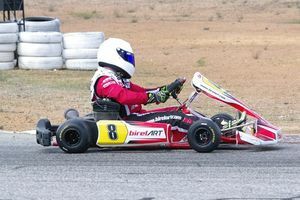 Luca Nici took the win in his Ricciardo Kart over B-Sports Caleb Sumich and James Micucci-Allen having one of his best results since graduating from Cadet 9’s with a solid third place. Mason Harvey in his Deadly Kart survived the biff & barge and took the win over Cody Leunen. Riley Trager took a fine third place with a consistent drive. A small field of heavies was dominated by Jacob De Cerqueira from local legend Taj Thomas who got his first open podium and a very fast young lady Imogen Vince getting the bronze. A small field of KA3’s put on the best race of the day. 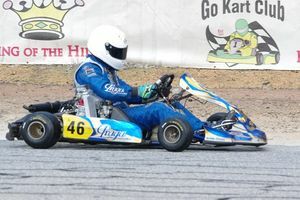 In race 2 the top 4 swapped positions consistently with Flynn Thompson taking the win. 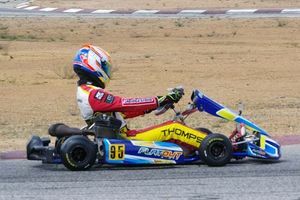 Thompson in his Exprit went on to win the meeting over Formula Ford pilot Jake Saywer and Italkart’s Chase Hoy in third. A big, beautiful field of vintage karts put on an awesome display for the senses; the sights, sounds and smell had everyone at the fence drooling. The attention to detail by the owners is an absolute credit to them. 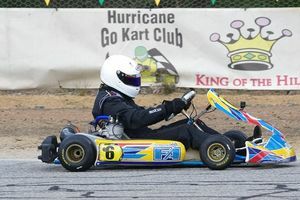 All in all, the event went very well, congratulations to the Hurricane Kart Club committee for trying a new format. 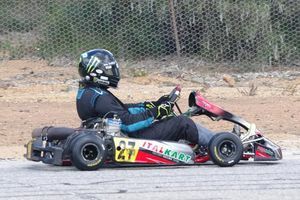 To quote a prominent WA karter – “this is the future of kart meetings”. Thanks to all the volunteers and officials who enabled the King of the Hill to run as smoothly as it did. 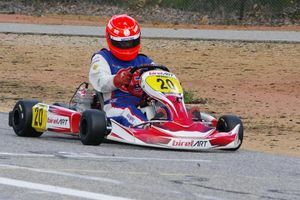 What's the best thing about the new Karting WA website?